A hallway in Sto-Rox high school is empty during a class period. Classroom rules are posted in the hallway of Sto-Rox High School. How a group of teachers restructured a school district. But while walking through one of the high school’s hallways earlier this year, Robert Spehar, the district’s teachers union president, noted the quiet efficiency of students moving from room to room. A few stragglers high-fived Spehar and shuffled to their next class. “It didn't use to be like this," he said. "It was chaotic." In addition to ever-changing principals, the district had a slew of superintendents until a permanent administrator was appointed in June. 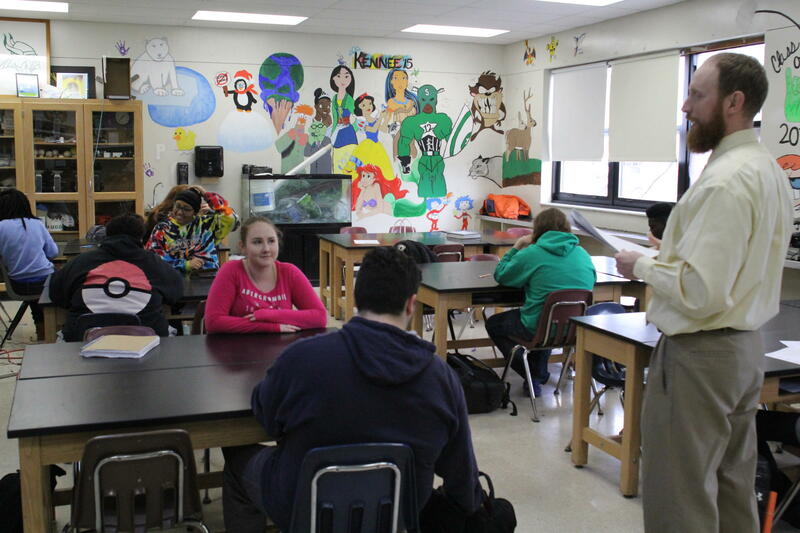 Joe Krajcovic, Sto-Rox High School science teacher, teaches a class last semester. Without steady management, some teachers said they had gone nearly a decade without a formal evaluation of their work. Teachers were losing motivation. A little more than a year ago, members of the union started talking to administrators about restructuring the system. They decided the best way to make a change would be to take some of the burden off the principal. Frank Dalmas was appointed superintendent and given a three-year contract in June after the former administrator resigned. He’s worked in the district for nine years, formerly as the director of pupil services, and said he’s watched numerous principals leave as a result of the demanding work. “The meetings that occurred in a school, the discipline that occurred in the school, the curriculum needs of a school, it was too much,” he said. Some small schools still use a model with one person – a principal – in charge, but most suburban schools have a team of people in charge, including vice principals, deans and counselors. When Dalmas took over, he said he knew any changes needed to be systemic. The district didn’t have the budget to add new positions, so they rearranged the current employees. District officials created a dean of discipline position to help take the burden of reprimanding students and relaying information to families off of the principal. A head teacher position focused on curriculum and being a point person for teachers was also created. In a move to balance the student population among the district’s three buildings, classes were also redistributed. In 2016, a majority of Sto-Rox elementary and middle school students tested at or below the basic level of understanding in English, math and science in the Pennsylvania System School Assessment. 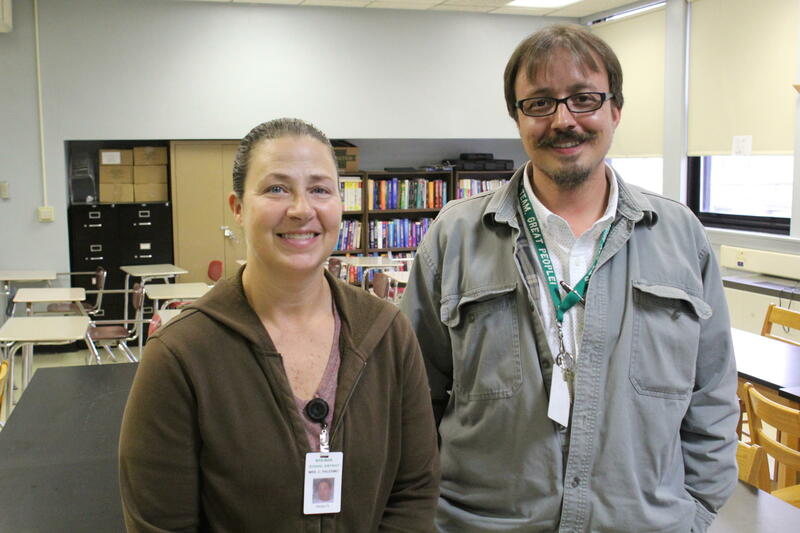 Sto-Rox Education Association Vice President, Carrie Palermo, and President, Robert Spehar, are pictured at the Sto-Rox High School. A majority of the district’s 11th graders also performed at or below the basic requirements in algebra, literature and biology in the state’s Keystone Exam. To improve those scores, district officials gave each building a focus. The kindergarten through 3rd grade school now emphasizes reading at grade level. The 4th through 6th grade school is teaching students different strategies in learning. The junior and senior high schools are preparing students for careers. It took some time to get to that point. Carrie Palermo, union vice president, said when there was a vacant position on the school board last year, the union vetted candidates that would support the move. They stood outside of polling places for hours advocating for their candidate. “I think for the first time in a long time, we had teachers who raised concern and went out into the community and said to community members, ‘If you care about this district, if you want it to be here, will you please run for the school board,’” she said. The teachers had operated for years without a contract and under a hiring freeze. The reconfiguration became a bargaining chip in contract negotiations. The new contract was adopted in 2016 and runs retroactively from 2013 to 2021. Palermo said, though, the most important move was giving teachers ownership of their work. She’s worked in the district for 24 years and said for the first time she feels like she can focus on teaching. Spehar said most of the animosity amongst teachers is dwindling. “People are excited to be there again,” he said. The district has operated under the reconfiguration for seven months now. It’s going to take time to see the full effect of the work, Dalmas said. “We’ve really taken the first step forward to make sure our students are graduating from a safe environment and are ready to start that next phase in their life,” he said. Can McKees Rocks Share In Pittsburgh's Success? McKees Rocks, Pennsylvania is just 15 minutes from downtown Pittsburgh. It has a rich history. The first American Eagle Outfitters opened there in 1912. A native American burial mound in the borough is the earliest place of human habitation in the region. But while Pittsburgh is experiencing a renaissance, the blue-collar borough is still struggling to get back on track. Remembering Billy Mays Jr. with Billy Mays Sr. Considered America's greatest pitchman, Billy Mays Jr. could be found, day and night, selling products on TV commercials. Billy Mays Sr., author of the book My Son, Billy: A Father Remembers the Greatest Pitchman Ever talks about raising his son in McKees Rocks.